Fiat's new Compact platform will debut on the Alfa Romeo Giulietta in Geneva. BALOCCO, Italy – Fiat S.p.A.'s new Compact vehicle architecture is scheduled to underpin 700,000 Chrysler group vehicles a year in the U.S. and 300,000 in Europe by 2014. The architecture will debut in Europe on the new Alfa Romeo Giulietta sporty hatchback, which will premier at the Geneva auto show next month. Fiat and Chrysler are currently developing a widened version of the architecture, called Compact Wide, which will underpin at least seven new models for the Chrysler, Dodge and Jeep brands. The first Chrysler group cars to use the Compact Wide architecture will be two compact sedans that will replace the Chrysler PT Cruiser and the Dodge Caliber in 2012. Fiat and Chrysler CEO Sergio Marchionne plans for the combined Compact/Compact Wide architecture volume to exceed 1 million units built per year within four years. The Compact architecture's modular design means that it can underpin vehicles of wheelbases of different sizes and thus different lengths. 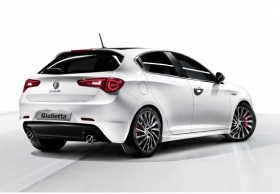 Fiat said it benchmarked Alfa Giulietta rivals such as the Audi A3 and BMW 1-series models for the new architecture. "In developing the Compact architecture, we looked for best-in-class performances in terms of handling and steering response, weight-to-power ratio; noise, vibration and harshness, active and passive safety," Stefano Re Fiorentin, Fiat's head of advanced engineering, said at the Fiat's testing grounds in Balocco, 40km west of Milan. Fiat's Compact platform uses 84 percent high and ultrahigh strength steel, compared to 65 percent for Fiat's previous C-architecture. For handling and steering response, Fiat designed a new McPherson front suspensions, as well a dual-link rear suspension. To save weight, front and rear suspension arms, as well the rear suspension crossmember, are aluminum. To increase the response of the electric power steering, the electric motor is mounted on top of the rack-and-pinion box and not on the steering column. Looking for best-in-class weight-to-power ratio, 84 percent of the platform uses high and ultrahigh strength steel, compared to 65 percent of Fiat's previous C-architecture. Re Fiorentin said the Compact platform, which weights 174kg, is about 10 percent lighter than its predecessor. Other weight-saving components are a magnesium crossmember under the dashboard and a plastic shell for the rear seats, each 35 percent lighter than a steel equivalent. Compact and Compact Wide are designed for front- or four-wheel-drive applications with transverse engine. Fiat Chief Technical Officer Harald J. Wester said the architecture represents 30 percent to 35 percent of a vehicle's total cost. Another 10 percent to 15 percent of the cost comes from additional common components such as airbags, instruments, hinges, locks and sensors. The engine, transmission, hot part of the exhaust system and gearshift cover another 25 percent to 30 percent. The final 25 percent to 30 percent is from specific components, such the entire upper body, the dashboard, front and rear lights, interior and seat trim.